1 Universidade Federal do Rio Grande, Instituto de Oceanografia, CP 474, Rio Grande, RS, Brazil. 2 Virginia Tech, Virginia Seafood Agricultural Research and Extension Center 102 S King Street, Hampton, VA, 23669, USA. ABSTRACT. Cobia (Rachycentron canadum) is a marine finfish with good potential for mariculture. This study analyzes the effects of probiotic Bacillus spp. on the performance of cobia larvae reared in a recirculating aquaculture system (RAS). Larvae were stocked into two independent RAS for 26 days after hatching. One of the systems (Probiotic treatment) received the addition of a commercial probiotic consisting of B. subtilis, B. licheniformis and B. pumilus directly into the water and by live feed. Survival, final weight and water quality were not affected by probiotics. Results showed larvae of the probiotic treatment demonstrated a greater resistance to salinity stress. Immunohistochemical analysis showed a higher expression of CD4 in probiotic treatment. These results suggest that Bacillus spp. probiotics used in RAS have a potential stimulating impact on immune system differentiation and increases salinity stress resistance of cobia larvae. Keywords: Rachycentron canadum, cobia, Bacillus, aquaculture, immunostimulation, immunohistochemistry, mariculture. RESUMEN. Cobia (Rachycentron canadum) es una especie de pez marino con buen potencial para la maricultura. Este estudio analiza los efectos del probiótico Bacillus spp. sobre el desempeño de las larvas de cobia criadas en un sistema de recirculación de agua (RAS). Las larvas fueron sembradas en dos RAS independientes durante 26 días después de la eclosión. Uno de los sistemas (tratamiento experimental) recibió la adición de un probiótico comercial que consiste en B. subtilis, B. licheniformis y B. pumilus directamente en el agua y por alimento vivo. La sobrevivencia, peso final y calidad del agua no se vieron afectados por los probióticos. Los resultados mostraron que las larvas del tratamiento probiótico presentaron una mayor resistencia al estrés por estrés salino. El análisis inmunohistoquímico mostró una mayor expresión de CD4 en el tratamiento probiótico. Estos resultados sugieren que estos probióticos utilizados en las larvas de cobia en RAS tienen un potencial impacto estimulante sobre la diferenciación del sistema inmunológico y aumenta la resistencia al estrés de las larvas de cobia. Palabras clave: Rachycentron canadum, cobia, Bacillus, acuicultura, inmunoestimulación, inmunohisto-químico, maricultura. Cobia (Rachycentron canadum) is a marine finfish that has an emerging global potential for mariculture due to its extraordinary growth rate (Sampaio et al., 2011) and overall aquaculture performance (Holt et al., 2007). Aquaculture environments can be stressful, triggering high mortality, especially during larval rearing (Avella et al., 2010). Typical intensive larviculture production protocols can cause disease by opportunistic pathogens (Hansen & Olafsen, 1999) and in order to avoid these potential diseases and antimicrobial drugs, the use of probiotics in aquaculture is suggested (Gatesoupe, 1999; Velmurugan & Rajagopal, 2009). Bacillus spp. probiotics are commonly used in animals and the beneficial roles of Bacillus spore applications in the aquaculture field are well established (Queiroz & Boyd, 1998). Probiotics can be defined as live microbial feed supplements that can improve host intestinal microbial balance of the host and in turn its health (Gatesoupe, 1999). It has also other beneficial effects, as improvement of water quality (Wang et al., 2008). In aquaculture, probiotics can be inoculated into the rearing water or incorporated into the dry or live feed (Taoka et al., 2006). Several positive effects of probiotics in fish culture have been demonstrated, such as higher survival (Velmurugan & Rajagopal, 2009), faster growth (Aly et al., 2008), improved stress tolerance (Rollo et al., 2006), immune system enhancement (Picchietti et al., 2009; Cha et al., 2013), and general welfare (Silvi et al., 2008). These multiple effects of probiotics confirm their successful use in fish husbandry areas including nutrition, environmental control and immunity (Lazado & Caipang, 2014). 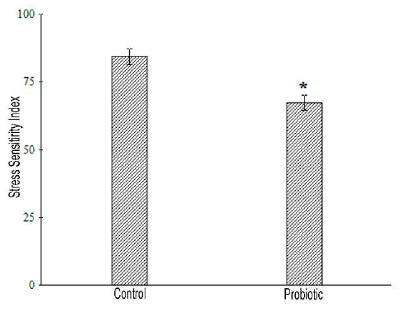 The effects of probiotics on immune response include the enhancement of non-specific immune responses (Taoka et al., 2006) and increase of T-cells (Picchietti et al., 2009). Some immunohistochemical markers can be used to study leukocyte populations, like the T-cell co-receptors CD3 and CD4 that are essential for cell-mediated immunity (Laing et al., 2006) . The CD4 co-receptor occurs in T-helper cells, which play a central role in the immune system (Romano, 2010). Immunohistochemistry is an important technique that can be used to evaluate fish immunity although most studies on probiotics in fish culture focus on pathogen challenge (Picchietti et al., 2007). Recirculating systems can be used to maximize biosecurity and seasonal environmental influences (Lyndon, 1999) in marine larviculture. However, few studies have evaluated the use of probiotics in these systems (Chen & Chen, 2001; Taoka et al., 2006). Thus, this study aims to examine the effects of a probiotic composed of three Bacillus strains on survival, growth, immunostimulation, and resistance to a salinity stress challenge in cobia larvae reared in a RAS. The experiment was conducted at Virginia Tech's Virginia Seafood Agricultural Research and Extension Center (VSAREC) (Hampton, VA, USA). Two independent RAS were used in this experiment, each comprised of three tanks (300 L each) (Holt et al., 2007). The probiotic treatment and the control were randomly assigned to one recirculation system each (n = 3); because of the nature of the study, tanks could not be randomized among systems. Fertilized cobia eggs were transported from Trout Lodge Marine Farms (Vero Beach, FL, USA) to the VSAREC. Eggs were incubated until hatching and newly hatched larvae were stocked into the experimental tanks at a density of 15 larvae per liter. Larvae were produced according to standard larviculture production protocols (McLean et al., 2009). They were maintained in a green water system, by algal paste additions (Instant Algae Nanno 3600, Reed Mariculture, Campbell, CA, USA) in a concentration of 106 cells mL-1. L-type rotifers were enriched for 6 h with Protein Selco Plus (INVE, Salt Lake City, UT, USA) and were fed from 2 through 9 dph. Newly hatched AF Artemia (INVE, Salt Lake City, UT, USA) were fed from 7 through 10 dph and enriched GSL Artemia (INVE, Salt Lake City, UT, USA) were fed from 10 through 23 dph. Artemia were enriched for 24 h with DC DHA Selco (INVE, Salt Lake City, UT, USA). Co-feeding of larvae with Otohime Marine Larvae Weaning Diets (Reed Mariculture, Campbell, CA, USA) began on 15 dph, weaning protocols began on 21 dph, and all fish were fully weaned and Artemia discontinued by 23 dph. Flow rate in the RAS was maintained at 60 L h-1 from stocking through 9 dph. On 10 dph, flow increased to 90 L h-1; on 12 dph, flow was increased to 120 L h-1; on 13 dph, flow increased to 180 L h-1; on16 dph, flow was increased to 240 L h-1 and on 18 dph flow increased to 300 L h-1 and remained there for the rest of the study. The photoperiod was maintained at 24 h light using fluorescent light banks. Initial system salinity was 35 g L-1, which was reduced 1 g L-1 per day until a final salinity of 22 g L-1 was achieved at 13 dph. At the end of the experiment (26 days post hatch), 150 fingerlings were randomly sampled from each tank to determine final individual weight. All remaining larvae from the six experimental tanks were counted to determine survival. A commercial Bacillus mixture provided by INVE Technologies (Belgium) was used. It is composed of B. subtilis, B. pumilus and B. licheniformis (1x1010 CFU g-1). Each Probiotic treatment tank received a daily probiotic dose of 5 g m-3 directly into the water (5x104 CFU mL-1), equally divided into four applications. Live feeds for this treatment were also enriched with the probiotic, adding 0.5 g L-1 of enrichment medium 6 h prior to harvesting, according to the manufacturers specifications. Temperature, salinity, pH, dissolved oxygen, alkalinity, total ammonia-nitrogen (TAN), nitrite (NO2), and nitrate (NO3) were monitored daily. Water temperature ranged from 27.9-28.5°C, dissolved oxygen concentration was maintained above 6.1 mg L-1 and pH was 7.9 ± 0.1. Alkalinity ranged from 142-186 mg L-1. Water samples for microbial analysis were taken daily and determined by plating 1 mL water sample from each tank. The culture medium Trypticase™ Soy Agar 2% NaCl was used for total spore-forming bacteria abundance after sample pasteurization in order to eliminate non-spore-forming vegetative cells (Miskin et al., 1998), assuming that most of the spore-forming cells were Bacillus. For total Vibrio, the samples were placed on Thiosulfate Citrate Bile Salt Sucrose agar. Abundance was expressed in colony-forming units per mL (CFU m L-1) according to Banwart (1989). After 26 days, a stress challenge was carried out according to Dhert et al. (1992). Ten fish per tank were transferred to 2 L-beakers at 60 ppt salinity and survival was monitored at 5-min intervals until mortality reached 100%. The sensitivity to the stress of salinity was expressed by the Stress Sensitivity Index (SSI), which was calculated as the sum of cumulative mortality observed over the test period (Dhert et al., 1992). The higher numeric value of the index indicates greater mortality of the larvae, which denotes that they were less able to tolerate the stress of the salinity shock. At the completion of the study ten fish per tank were sampled for immuno histochemical analysis of the thymus. They were fixed in 10% buffered formalin, embedded in paraffin and sections stained with haematoxylin and eosin. In addition histological sections were also stained using immuno histochemical procedures, according to a modified avidin-biotinperoxidase complex technique (Hsu et al., 1981; Prophet et al., 1992). This involved tissue slides being deparaffinised, rinsed with xylol and then rehydrated with alcohols of different grades (absolute ethanol, 90, 80, 70, 50%). The endogenous peroxidase activity was blocked by incubating the slides for 20 min in 0.3% H2O2 in a 5% methanol solution. After washing the slides in water and PBS/0.05%-Tween 20 solution, they were incubated in normal 1/100 serum (Vectastain Universal Elite, BC Kit, Vector) in a 10% PBS bovine serum albumin (BSA) solution at normal temperature for 30 min in a humid chamber. After incubation, the primary anti- CD3 a CD4 antibody (Dako, Argentina) was added at a dilution of 1:200 in PBS-BSA 10%, and the slides were incubated overnight at 41°C in humid chamber. This was followed by rinsing and incubation for 7 min in a 50 mL 30.3-diaminobenzidine (DAB, Sigma-Aldrich) solution containing 1% PBS-BSA in 50 mL H2O2. Counterstaining was then performed with haematoxylin. The CD3 and CD4 receptors were submitted to quantitative analysis of phenotype expression percentage per square millimeter of tissue (Romano et al., 1996) using the software Bioscan OPTIMAS® 6.1 (Weibel, 1979). All data was compared using a Student's T test with Statistica® 7.0 (StatSoft, Inc., Tulsa, OK, USA). Differences were considered significant at P < 0.05. Throughout the experimental period all water quality parameters were maintained within suitable ranges for cobia. There were no significant differences (P > 0.05) in survival, final weight, water quality and total Vibrio counts between treatments. Nevertheless, total count of spore-forming bacteria in the probiotic treatment differed statistically, with a higher concentration in the probiotic treatment (P < 0.05) (Table 1). superscript are significantly different from each other (P < 0.05). In the stress challenge, the probiotic treatment had lower Stress Sensitivity Index than the control (P < 0.01) (Fig. 1). statistically significant difference (P < 0.01). The expression of CD3 in thymus tissue showed no statistical differences between groups. 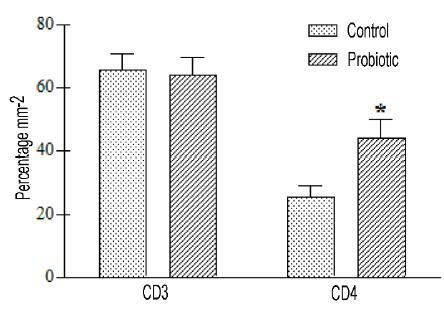 However, CD4 expression was significantly higher (P < 0.01) in the probiotic treatment (43.7 ± 6.2% CD4 cell mm-2) than in the control (25.4 ± 3.5% CD4 cell mm-2) 7 (Fig. 2). deviation and asterisk shows significantly statistic difference (P < 0.01). The use of Bacillus species as a probiotic in aquaculture is common (Gatesoupe, 1999). For example, it has been shown that Bacillus subtilis can improve the immune conditions, growth and survival of Oreochromis niloticus (Aly et al., 2008), Ictalurus punctatus (Queiroz & Boyd, 1998) and shrimp Penaeus monodon (Rengpipat et al., 2000). Due to the addition of commercial Bacillus strains into probiotic treatment, total spore-forming bacteria counts were higher in this group. The water exchange rate in the RAS tanks is increased as fish grow larger to maintain homogeneous fish and live feed distribution (Holt et al., 2007). This practice makes water recirculate faster in the system filters, mechanically removing probiotics, and it increases the flow of water into the UV sterilizer. In open aquaculture systems such as ponds and tanks, probiotics are added after each water exchange. However, in RAS the appropriate frequency of probiotics addition has not been determined and would likely differ from that recommended by the manufacturers for open systems (Garrido-Pereira et al., 2013). The presence of spore-forming bacteria in control may be explained by the presence of different bacteria sporulating in marine water (Tarasenko et al., 2012). Vibrio spp. are normally present in larval gut flora and in the live feed, and they usually cause disease under sub-optimal culture conditions (Decamp et al., 2008). Several authors (Moriarty, 1998; Gatesoupe, 1999; Chen & Chen, 2001; Vaseeharan & Ramasamy, 2003) reported an inhibitory effect of circulating Bacillus on Vibrio loads. In our trial Vibrio counts were apparently not affected by probiotic bacteria, but fish showed no sign of vibriosis or other diseases. Larvae reared with probiotic during this trial showed greater resistance to the stress test, suggesting that larvae supplemented with Bacillus spp. have better quality than those reared without probiotic. According to Dhert et al. (1992), when organisms are exposed to different treatments they will first undergo some physiological changes, which will inevitably affect their resistance, before the impact on growth and survival may be noticed. Survival is commonly used as a sole indicator in determining larval quality, however it can be influenced by many parameters and it does not reveal the actual condition of the fish. Immuno histochemistry analysis confirmed CD3 and CD4 thymocytes at 26 dph in cobia, suggesting that critical events of differentiation of T lymphocytes could occur before weaning in this species. The thymus plays a pivotal role in the adaptive immune system and the CD3 complex is a co-receptor that serves as a marker for general T cell identification in fish (Øvergârd et al., 2009). One of the major subclasses of T cells is CD4-expressing cells called T helper, which is originally a CD3-expressing lymphocyte that receives a CD4 receptor during the process of maturation (Laing et al., 2006). This type of lymphocyte stimulates the secretion of cytokines that produce antibody responses or lead to macrophage activation (Buonocore et al., 2008). In present work there was no increase in the number of T lymphocytes in general, but there was an increase of T helper type in the probiotic treatment. This demonstrates the stimulation of T cells differentiation into T helper achieved by Bacillus spp. in the probiotic treatment, since the expression of CD4 was higher in this group. Olafsen (2001), Picchietti et al. (2007) and Guzmán-Villanueva et al. (2014) reported the use of live feed cultured with selected bacterial strains to improve immunity, growth and survival. The ingestion of live feed containing probiotics may have been crucial in this trial, since RAS have equipments that can hamper the positive effects of probiotic bacteria added into the water (Garrido-Pereira et al., 2013). Further investigations must be conducted to evaluate optimal probiotic doses for RAS. In conclusion, the probiotic bacteria (B. subtilis, B. pumilus and B. licheniformis) tested in this trial stimulated the immunological system by T-cells differentiation in cobia larvae and improved their salinity stress tolerance although it had no noticeable effect on survival or growth. The authors wish to acknowledge the support of this project from the VSAREC, the International Initiative for Sustainable and Biosecure Aquafarming (IISBA) and Dr. Jesse Trushenski for statistical counseling. M. A. Garrido-Pereira and R. V. Rodrigues are supported by Brazilian CNPq. L. A. Sampaio is a research fellow of Brazilian CNPq (# 308013/2009-3). Partial fundings for this study were provided by MCT/CNPq/CT-Agronegócio/MPA (Edital 036/2009, # 559741/2009-0) and EMBRAPA.